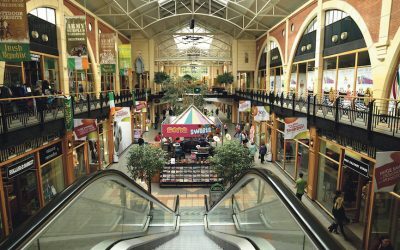 Green Property is to sell the Killarney Outlet Centre after operating it for the past 18 years. Property adviser CBRE is guiding €11.5m for the shopping complex which is producing a rental income of about €1m a year. Although it offers well-laid out shopping facilities and is located next to the bus station and the railway station, the centre has had challenging times over the years as Green Property strove to find the right mix of traders. Its anchor tenant, Nike, pays a rent of €110,000 for a factory outlet extending to 678 sq.m (7,297 sq.ft). The other major players are Leading Labels, which pays €80,000 for 585 sq.m (6,300 sq.ft); Pavers Shoes, which pays €75,000 for 288 sq.m (3,100 sq.ft); DV8, which pays €60,000 for 371 sq.m (4,000 sq.ft); and The Works, which pays €60,000 for 213 sq.m (2,300 sq.ft). Other tenants include Claire’s Accessories, Holland & Barrett, Tiger and Trespass. The centre also benefits from having food and beverage retailers Costa Coffee and O’Briens. CBRE reports that 4.5% of the overall retail area of 8,407 sq.m (90,497 sq.ft) is currently vacant and almost all of it is on the first floor. The centre is broken into 39 retail units ranging in size from 932 sq.m to 678 sq.m (1,000 sq.ft to 7,297 sq.ft). The agency acknowledges that there is “significant potential for rental growth” once the next owners embarks on “active asset management”. Whoever buys the centre is also expected to introduce longer lease terms for individual traders instead of the current leases of five years. If the centre sells for the asking price of €11.5m, it will work back to a capital value of only €127 per sq.ft. The outlet centre has two entrance points on opposite sides of the centre and 230 parking spaces on the overall site which extends to 2.08 hectares (5.14 acres). Fiona Kennedy of CBRE said the centre had performed “exceptionally well” in recent years attracting high-quality retailers. However, she said there was significant potential for rental growth which can be achieved through letting the vacant space. Niamh Sheahan, the letting agent for the Outlet Centre, said there was an excellent asset management opportunity to lease the vacant units “and introducing complementary users which will further enhance the tenant mix in place”.